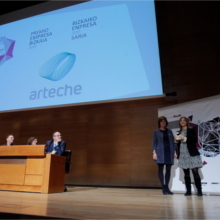 Confebask, the Basque Business Confederation, has awarded the Arteche Group with the Empresa&FP 2018 award. This award recognises our commitment and support to vocational training, dual training and professional practices and our contribution to the Training Centres. The Arteche Group has been suggested as a candidate by the Professional Training Centre of Mungia. This centre originated at the Escuela Parroquial Elemental de Trabajo de Mungia, founded in 1951 with Mr. Aurelio de Arteche as a prominent founding member. Since then, Arteche has been committed to professional training, to promote equality of opportunity and the development of our team’s professional career, and as a way to achieve our goals and overcome the challenges we face.